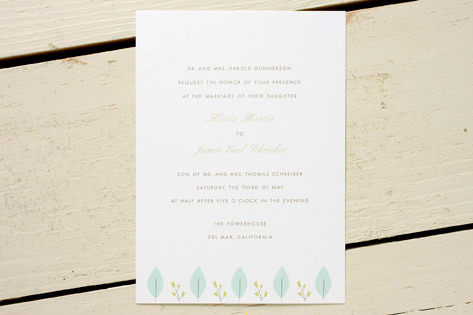 A row of modern, stylized leaves embellishes these wedding invitations, giving the feel of a carefully manicured garden. Lovely for a casual, yet stylish, spring or garden wedding. Available in pool blue/sage green (shown), sage green/pale pink, and blossom pink/poppy orange.